Preparing in advance for the Camino can be worth its weight in gold – you can make the walking easier, budget your money better and like any travel abroad, avoid any unpleasant surprises! This decision probably revolves around 3 issues, namely when your work or school situation allows you to go, the weather you will face while there and how busy the Camino will be when you go. For school groups, you will be restricted to Easter and summer holidays, whereas working adults will be restricted by when they can take their holidays. While the Camino can be walked all year round, allowing for changes in climate, the main walking season runs from April to mid-October. The Camino Francés travels across many sub-climates in the north of Spain, passing from the Pyrenees to the meseta, the Spanish plain, to the mountains and temperate climate of Galicia. The Galician climate, in summary, is somewhat similar to Ireland’s. Average daily temperature highs in Galicia are 3-4° higher than Ireland and it rains less often (though more heavily) in Galicia than it does here. For a detailed look at the differences in climate, please click here. 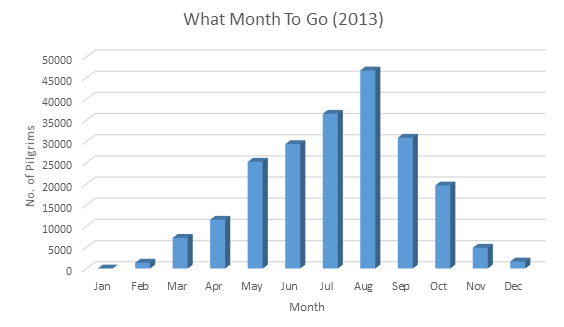 The busiest month overall (see accompanying graph) on the Camino for walkers is August and this has advantages and disadvantages depending on your personal preferences. July, September, June, May, October and April follow in order from there. 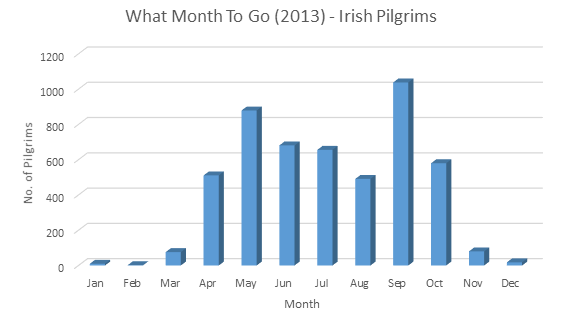 Strangely enough, the numbers of Irish walkers doesn’t follow the overall pattern at all, with September and May being the 2 busiest months. This is completely up to you! 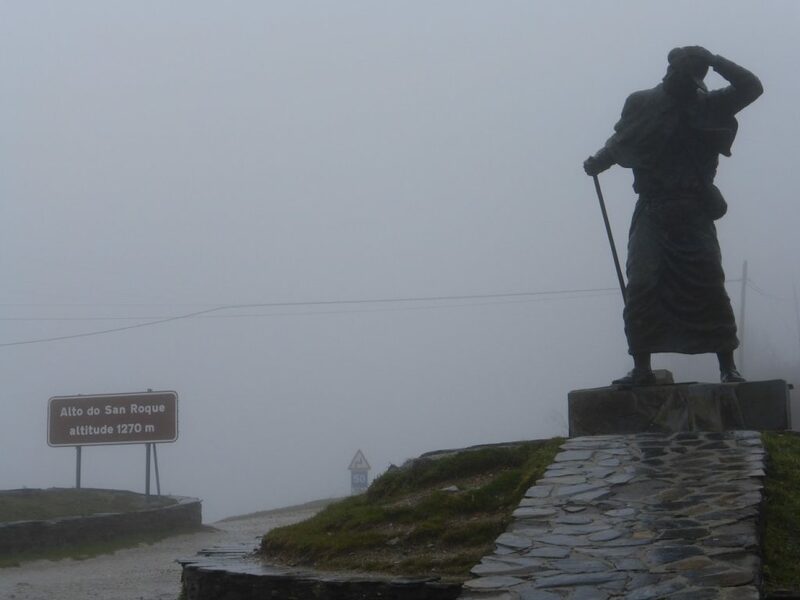 Most of our packages are for a week with 5-6 days of walking, while the full length of the Camino Francés (starting in St. Jean Pied De Port) will take anywhere between 30-35 days. There are so many variables to this decision that the best advice we can give is simply to contact us and we will help you figure it out! Generally speaking, the more physical preparation you do, the more comfortable you will find your walking. But again, there are many variables to this – the section you walk, how many days you walk for, how many km you cover each day, how hilly your stage is, the type of terrain you walk on, the quality of your walking boots, whether or not you carry your own rucksack, how fit you are and so on! Once more, just contact us and we will advise you! If you book a package with us, we will obviously arrange your complete itinerary for you. If you are doing your own thing, feel free to contact us and we will help you to work out how to get there. From Ireland, Aer Lingus fly from Dublin to Santiago De Compostela 3 times a week from April-October (Tuesdays, Thursdays and Saturdays) and add an extra Wednesday flight for July and August. From Santiago, it is possible to arrange transfers out to your starting point if it is relativel close by. Otherwise, it depends on where you hope to start from, so you might consider flights to Biarritz, Santander, Madrid or Barcelona with Ryanair or Madrid, Bilbao or Barcelona with Aer Lingus. The clothes you wear and what you carry in your bag are two of the most important decisions for you to make. The less you carry, the lighter your bag (if your bag ways any more than 8-9kg, you’ve made a bad start!). Against that, if you brought every item that might well be useful, you’d need your own donkey to help with the load! If you’re asking us for the 3 most important items to decide upon (and that’s what we’re here for! ), our advice is your boots, your bag and then your boots again. So you’ll have to make some decisions, but to help you on your way, feel free to click here for guidelines on what’s essential and what’s optional.